It’s been years since you cleaned out your garage, basement, or attic. Among the old family photos and Christmas decorations, you find your old VHS players, worn-out printers, and useless mp3s. We all have this stash of electronic waste, whether it is old charging and USB cables, or an unused cellphone. The pile grows with each new device that comes out. So, what can we do with our electronic leftovers? Some devices can be thrown away, but others must be recycled by law. Dumpster Rental can haul electronic waste, but it does not go into the normal roll-off dumpster. If this fits your needs, contact the office for more details. However, you could drop off your devices to places specialized in electronics recycling. In the Fort Collins area, there are different stores and centers that allow you to dispose of your unwanted electronics. These devices cannot be placed in a roll-off dumpster. When considering making a trip to a facility near you, there are some additional things to consider. Does the electronic still work? If you have a TV, printer, cable, etc. that still functions, consider donating the device to a second-hand store like Goodwill or the Habitat ReStore. Does the facility have a fee? 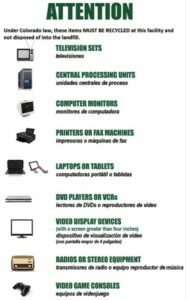 Some facilities charge a handling fee for electronic waste. This could be for all electronic waste or simple large items. Be sure to check the website or call ahead before being surprised on your trip over. Can the device go back to the parent company? 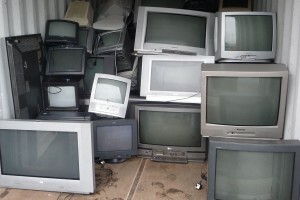 A number of companies will accept end-of-life devices in order to reuse systems and parts. If you have a product under Dell, HP, Apple, Gateway, or Toshiba, consider contacting them to find out more. Electronic waste shouldn’t just be thrown out with the rest of your trash. Properly recycling or donating devices is the best course of action.